Expect plenty of mother nature's treasures as well as cultural sites combined with fabulous mountain and sea activities. Treasure the impressive mountain range “Picos de Europa”, breathtaking beaches, picturesque villages and aristocratic cities — the tour gives a taste of the best of northern Spain for both eyes, mouth and soul! 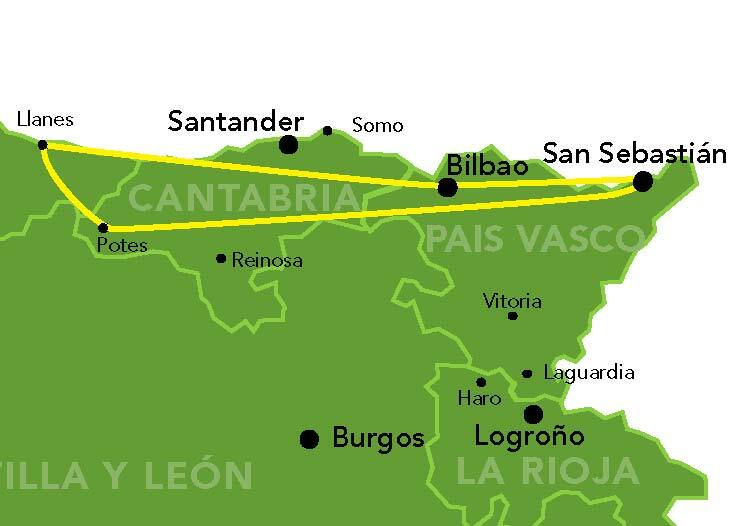 - Spain is More can arrange your flight to/from Bilbao (surcharge). In case of arrival to another airport, the itinerary can be changed. Accomodation: charming hotel in city center close to beach. Llanes is one of the cosiest and most atmospheric fishing villages on the Spanish north coast. The beaches and the idyllic old town which winds around the harbor, are among the reasons for the popularity. The large selection of good restaurants will contribute to many exciting flavors. On the trip from Bilbao to Llanes, passed a lot of interesting sights. Among other things, the beautiful coastal town of Comillas, where you can see one of Gaudi's architectural masterpieces, and Santillana del Mar, which is considered one of Spain's most beautiful villages, is like a museum with stone-paved streets and houses, churches, etc. The several thousand year old cave paintings in Altamira is also close to this end. The area is ideal because the town offers an ample opportunity for sightseeing, shopping and relaxation. Along the coast, a number of attractive swimming and fishing villages offer lovely restaurants that serve local delicacies. Furthermore, you will find world famous architecture, impressive zoos and some of Spain’s most spectacular National Parks. The Liébana valley in the Picos de Europa mountain range provides a wide range of physical and natural riches to explore. In the hidden mountain villages, time seems to stand still, and you are transported to a bygone era. There are ample opportunities for hiking and other activities in the valley or in the awe-inspiring mountain peaks. The dramatic cable car in Fuente Dé elevates guests 750 vertical meters (2,460 vertical feet) to a panorama of sublime mountain peaks over 2,600 meters (8,500 feet) high. The small town of Potes is the region’s center, where delightful, cozy restaurants serve local specialties that can also be purchased in many quaint shops. The region’s foremost cultural monument is among the most important Catholic monasteries in the world, Santo Toribio de Liébana. Relax by the sound of the lazy river rippling by one of the valley’s best hotels and survey the surrounding mountains. The hotel is renowned for its charm, and its kitchen serves heavenly local cuisine. Accommodations: Charming B&B in the old town. In the eastern part of the Basque Country we find Spain’s cosmopolitan and gastronomic center — San Sebastian — a wonderful town that successfully blends traditional and modern. This urban hub is one of the hottest culinary destinations in the world, and the Basque Country boasts a high concentration of Michelin Star restaurants. In fact, one main attraction of this stunning city is its exquisite cuisine and atmosphere. The extensive white sandy beaches and its urban texture make San Sebastian a popular holiday destination. Rented car all days. Category: Ford Fiesta or similar (inclusive unlimited mileage, taxes and basic insurance). Upgrade when more than 3 pax.